Available as a pair in Left or Right hand fittings. 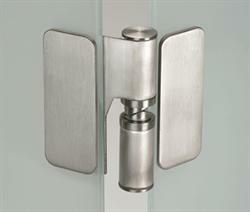 Suitable for 10mm glass and 13mm overlapping systems Can be adjusted to fall open or fall closed. Be the first to submit a review for the Glass Patch Fitting Heavy Duty Hinge Set.